Like every season, the show I look forward to most in Paris Fashion Week is definitely Balmain. I'm sure many of you know that I love Balmain and am a huge fan of Christophe Decarnin's work. But.. I was incredibly disappointed by what Decarnin offered in his latest Spring/Summer 2010 collection. As a whole, the collection look like what was presented at Isabel Marant Fall/Winter 2010. Biker jeans in leather/metallics. The entire collection are probably made of studs and safety pins which we've seen before. Seems like Decarnin chooses to stay in that zone -which I am tired of. With that being said, safety pins and studs.. we can all DIY our own "Balmain" outerwears! 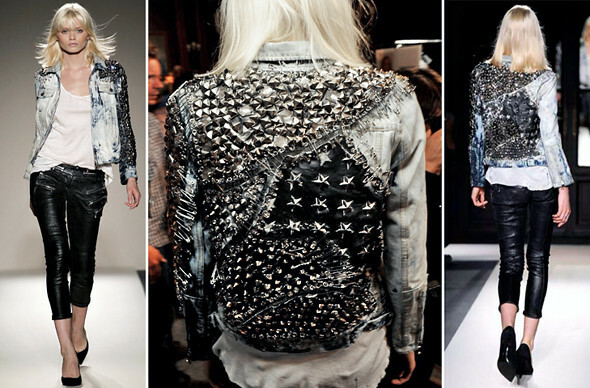 My favorite from the collection is Abbey Lee Kershaw's acid-wash denim outerwear which is pinned and studded at the back. I have a few denim jackets at home and have seriously thought about bleaching and studding them. I'll tell you guys if I do it and probably make a tutorial out of it! I thought the printed flags top look extremely tacky like they are from Topshop... and was also disappointed that there were no dresses at all! Positive comments I have is.. they will probably still look good in editorials, some of the decent outerwear will probably look better if styled differently (well not head-to-toe Balmain). Of course, there will still be people who are loyal to Balmain. The collection would probably grow on me when editorials/celebrities etc starts to wear them. I wish Christophe Decarnin will step up his game next season and bring us more glamorous fashion rather than sending out girls who look like they are heading to a punk-rock concert. One thing for sure we know.. Carina Lau (刘嘉玲) will love this. Fun fact - Pierre Balmain designed Singapore Airlines' uniform! I absolutely love Balmain also. This collection was somewhat dissapointing to me as well... I thought "i can just get a jean jacket and add studs to everything myself"